EA provides a template based approach to transform platform independent models (PIM) into platform specific models (PSM). The PIM is a higher level conceptual model whereby the PSM also considers platform (implementation) specific information. The PSM can be used to generate code after the transformation from a PIM. The same template framework is used to generate code from a model which is used for the model transformation. The syntax of the template framework is the same, only the concrete content of the template is different in model transformation and code generation templates. To support multi forward model transformations from a PIM, EA adds so called “trace-links” to the generated PSM. The trace links are used when the model transformation is performed a second time to update existing PSM elements when the corresponding PIM element has been changed. Changes mad in the PSM are not affected and remain the same. This allows adding additional platform specific information into the PSM and keeping the platform independent information in the PIM. 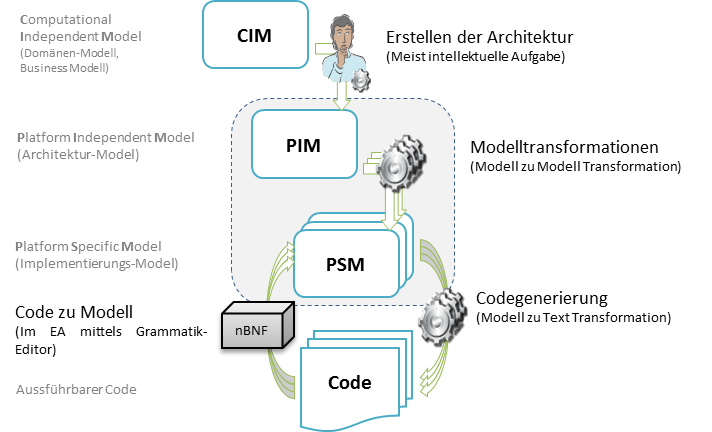 The model transformation weaves the changed within the PIM automatically into the PSM. Using multiple model transformations allows to generate many platform specific models from one single platform independent model. The existing model transformation templates can be customized to you needs, as well as new model transformation can be added.